3 Best Ridge Vents Reviews: Affordable and Effective in April 2019! A ridge vent is humidity and heat transfer unit found in many homes and industrial storage units, especially in hot and humid climates. These vents are used to help circulate the air by releasing the internal air pressure with a constant flow of fresh air from the outside. Ridge vents run the entire length of a roof, and they have evolved into an integrated system that includes external baffles with an internal weather filter and an under-eave venting. This trio, when constructed together, pack the best venting results. Ridge vents are very affordable and long-lasting solutions that can reduce cooling costs by relieving the use of air conditioners. Modern venting systems are unnoticeable and blend into the roof structure. A ridge vent needs access to a good intake of fresh, cool air in order to expel hot, humid air; essentially, they need a balanced equal flow of exhaust and intake to work properly. Here we introduce you to the leading ridge vents. We built this guide using three factors; type, dimensions, and material. This is the Cobra® Rigid Vent 3™ Exhaust Vent. It’s a solid flexible polymer vent that provides 18 sq. inches per linear foot of net free ventilating area. It comes with an EasyTear™ feature that enables you to specify the size you want in 3” increments. So, what do you get with this ridge vent system: you get a system that can withstand winds of up to 110mph, and this includes rain too. It prevents the accumulation of mold and wood rot in the ceiling timbers, and it extends the life of your external painted surfaces. You get a flexible hinge design that allows you to install on 3:12 to 16:12 sloped roofs and the unit comes with 3″ ring shank nails. You also get a smooth edge overhand, and it is also hip/ridge compatible with traditional sized models. This is very easy to install model, and its EasyTear™ feature gives you extra manipulation, which speeds things up. Al in all, this is a very comfortable product at a very budget-friendly price. This is another great GAF product, this is their COBRA® Exhaust Vent, which is Environmentally Friendly, and is made up of 100% recycled fiber. 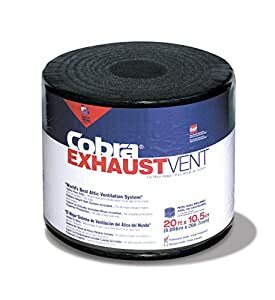 This is a soft-lining material that is easy to install and comes with Smart Nails™ for hand-nailing, or 1 ¾” (44 mm) coil nails The Cobra® Exhaust Vent will provide you with 16.9 sq. in./lineal foot (109 sq. cm/lineal meter) for hand nailing, and 14.1 sq. in./lineal foot (91 sq. cm/lineal meter) with nail gun application. GAF provides comprehensive solutions; you need to review all their options. This is their exhaust venting option and comes in two sizes. Its exceptional value for money, and when bought in conjunction with h their rigid vent solution, provides a perfect venting system. Quarrix Rigid Roll® and Rigid Section ridge vent is the Quarrix solution for venting. 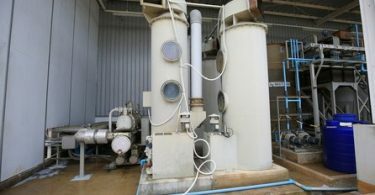 Their products are considered to be of the highest quality, and their assembly and installation are very simple. The rolls come with a 20-foot version, and the rigid sections are 4’ each. Quarrix also uses their StormStop® Membrane, which was developed to prevent harsh weather conditions from driving in rain or particles through the vents. This is a great ventilation system for homes as well as warehouses and commercial buildings. In fact, most Florida homes have this venting system installed to prevent the humidity from fouling up the attic air and creating mildew, mold, and corrosion of metallic parts. When buying this brand, make sure you match it to other parts of the same company. It is imperative to purchase a product from a reliable source, that is why this list is short, it gives you two main brands to choose from, and they are, in our opinion, the best and most reliable brands on sale today. 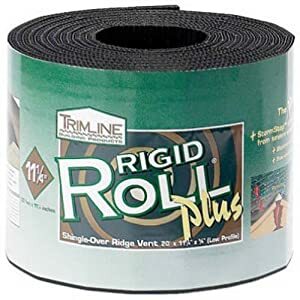 Trimline and GAF have whole product lines that support an entire roofing solution when you purchase a roofing system make sure you use the same product lines, its best not to mix them up. When replacing an old system, check to see the integrity of the entire roof. It is best not to do patchwork, and to replace either entire sections or the entire roof, dependent on the size you need to replace. Continuous Ridge or Box Vents? Continuous ridge vents are more effective than box vents since they are installed along the entire peak of a roof’s ridge. They allow warm air to escape from the attic and create enough suction (vacuum) to work on a constant basis. You only need to install one unit, and they blend into the roofs architecture. 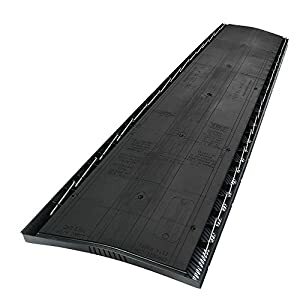 A boxed vent will sit on the roof providing localized ventilation only, sometimes the vacuum them produce is not enough, so you need more than one box, and as such, they clutter up the roof. Bottom line, continuous ridge vents are perfect for shingled roofs, Ridge vents will run along the length of the shingle and replace ridge shingles and tiles. Box vents work best with flat roof structures and require a hole in the roof to fit over for effectivity.